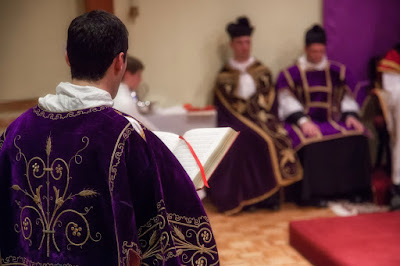 When I attended Thomas Aquinas College in California from 1990 to 1994, one of the first things I noticed about their Novus Ordo liturgies — apart from the startling fact that the unchanging parts were always in Latin, a practice they have been following for almost 50 years now — is that the reading was always done by one of the altar servers, vested in cassock and surplice. This struck me immediately as far better than the “normal” approach I had seen everywhere else, where a layman or laywoman gets up from the congregation and goes up to the ambo. Why did it seem better? First, the server was dressed for a liturgical function, so it made the reading seem more obviously a liturgical act, part of the act of worship in which were were involved. Second, he was already up there in the sanctuary, to which he had processed together with the priest, so he was on hand, ready to perform the function. It no longer looked random but orderly, the right person at the right time and place. Third, each day one of the servers knew ahead of time that he was going to be the reader, and over time the servers tended to become far better lectors than most of the enthusiastic volunteers or appointees who seldom had a clue what they were doing. Fourth, a man’s voice is better suited for such reading. In most cases, it sounds stronger, calmer, more resonant, more authoritative. 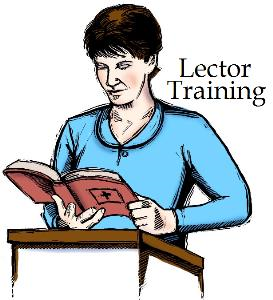 If “the lector sounds the voice of God,” then one ought to hear God speaking to us in His lordly, fatherly voice. As Psalm 28 has it: “The voice of the Lord is in power … The voice of the Lord breaketh the cedars … The voice of the Lord shaketh the desert.” As much as I admire the piety of ladies who eagerly serve as lectors, the timbral qualities one hears — from sweet and soft to schoolmarmish and scolding — are often simply not edifying. Besides, as a psychologist recently argued, it is more distracting to men when women are reading than it is to women when men are reading. There is no parity or equality of the sexes in this regard. These were some of the reasons why I rather liked the TAC practice after experiencing it, and I can’t say it surprised me when I discovered that the young ladies liked the practice, too. They were traditional in their views of liturgy and the roles of the sexes, and they felt a sense of relief at not being pressed into the modern feminist program of breaking down the “barriers” to an all-male sanctuary. They were quite content to let the men step up to the plate, as men should do — and as they usually will not do whenever women, with their native generosity and piety, are allowed to take over. These are the things that most caught my attention as a college student. Years later, I was involved in a Catholic community that had been following the TAC practice for a number of years but was forced to abandon it due to pressure from particular clergy who disagreed with it. Watching that sudden transition from vested servers in the sanctuary acting as lectors to plain-clothes laymen and laywomen rising from the pews to read a text and returning to their seats brought home to me how theologically problematic this contemporary praxis really is. In particular, it transmits both Pelagian and Protestant messages — a surprising combination, but nonetheless true. The Pelagian message is this. The lector walks right up into the sanctuary, although not vested, and usually not having been a part of the liturgical procession. Since liturgy of its essence is symbolic, this symbolizes something (whether intended to or not). Given that the sanctuary of the church represents heaven, walking right up into it symbolizes that any man has immediate, free, and easy access to the Holy of Holies. Heaven is ours for the taking, if we just take to our feet and use our God-given natural talents. A layman sauntering up into the holy place to read is the obliteration of the entire lesson of the Old Covenant — namely, that owing to man’s creatureliness and sinfulness there must be separation between man and God, which is overcome only by Jesus Christ, the Mediator between God and man. Christ does not abolish the distinction but takes it into His very Person, so that we have access to God through Him. Therefore the ministerial priesthood and all the lesser ministries that assist it must have this mediational characteristic in order to be true to themselves. The unvested lay lector seated in the nave who walks right up into the sanctuary is a walking, talking contradiction of the Epistle to the Hebrews. The Byzantine tradition, needless to say, underlines this point by forbidding a lay lector (if there be such out of necessity) to read except from the nave, and keeping the holy of holies off limits behind the iconostasis except to those clergy who are allowed to enter it. [Update: A reader has corrected me by pointing out that in the Byzantine liturgy the reading is always done from the nave, whether by a subdeacon or by a lector substituting for him. It remains true that laity never enter the sanctuary, which is the point I am interested in.] The West had the same understanding of sacred space even if, at a certain point, we lost our rood screens and other such dividers: while everyone was permitted to see the ritual actions taking place in the sanctuary, no one bodily entered into it except the sacred ministers. The abolition of this distinction, by way of lectors and extraordinary ministers of Holy Communion, is a symbolic erasure of the distinction between the source of holiness in Christ (who is most properly and clearly represented by the sacred ministers in the mediatorial roles) and the reception of holiness in the people (which is symbolized by their architectural separation and the manner in which they traditionally approach the sacraments — for example, receiving the host on the tongue from the anointed hand of a priest, who blesses them). Such an erasure may justly be called Pelagian, and it will be difficult to uproot a pervasive Pelagian habit of thinking in the people if this is the kind of thing they see whenever they go to church. Furthermore, there is an implicit Protestant message: anyone can read the word of God; no office is required. The Word of God is free and open to everyone; no one need be specially set apart to read its holy, awesome, fearful, comforting message. Its words are like all other words, for which only mere literacy, that is, a purely natural (not supernatural) qualification, is called for. Thus, these words are not treated as if they are divinely inspired tokens of the ineffable Presence of God, to be handled by men who are formally deputed for this sacred task. For Protestants and modern Catholics there is a democratic availability of the Word that bypasses or sidesteps the hierarchical structure of the Church rooted in the Apostolic Succession of the episcopacy and its assistant clergy. 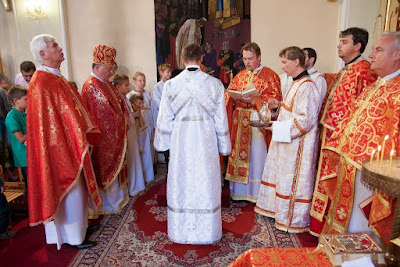 Contrast this with the traditional practice: only a vested lector — which, in the traditional Roman Rite, will be the subdeacon — may read. And at Low or High Mass, the priest fittingly reads everything because he contains in himself all the lower powers. What the lower may do, the higher may do, but not vice versa. Now, I do not deny for a moment that the vast majority of lay lectors have the best intentions in the world. They want to be involved; they want to be helpful; they are doing what they have been told is good. I myself was a lector for many years in high school because, well, it just seemed like a thing one does at Mass. So the problem is not one of bad will. The problem rather lies in the “law of unintended consequences.” Quite apart from our subjective good intentions, everything we do in liturgy signifies something. Liturgy is a realm in which nothing done is “merely” practical or useful. Even something as originally practical as the washing of the hands acquired a symbolic meaning of purity from sin that now dominates (most priests don’t have to wash dirt off their hands at the lavabo, but all of us have at least venial sins to wash away). 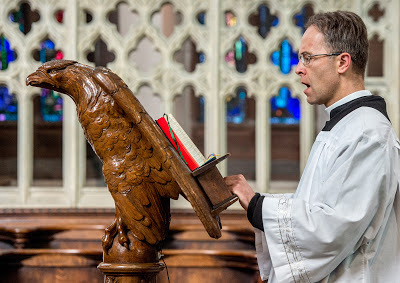 So, too, walking into the sanctuary, mounting the ambo, and reading from the Word of God are not mere human actions; the liturgical context endows them with a meaning of their own. In short, they are signs. Other related signs include the clothing one is wearing (is one vested for a liturgical ministry or wearing plain clothes? ), the type of language one is reading from the book (is the Word being delivered in a sacral and poetic register, or is it in an ear-numbing modern dialect like Nabbish? ), the quality of the lectionary and evangelary as physical objects (are they beautiful books or are they hideous chunks of self-conscious modernity, with all the charm of rock samples from Mordor? ), and so forth. All of these actions, objects, and appearances mean something. The important question to ask is what these signs are transmitting to us, what belief or attitude is being inculcated by them. When a lay minister distributes Holy Communion, for example, that says something: contrary to the way Catholics behaved for centuries, it turns out we are not, after all, dealing with a divine and fearful mystery, to be handled only by men specially set apart by a holy anointing and clothed in sacerdotal garb; we are dealing with ordinary food and drink that anyone can handle, as at a picnic or snack bar. It is a practical repudiation of the dogma of the Church, although perhaps few (except El Grillo) would think of denying Trent outright, although it should be noted that many people seem only too willing, in verification of Ratzinger’s oft-repeated critique, to make Vatican II the “super-council” that trumps even earlier Councils that are manifestly of greater magisterial weight inasmuch as they defined de fide dogmas and anathematized the contrary errors, while Vatican II purposefully avoided definitions and anathemas. In any case, what is crucial is not recovering the teaching of earlier Councils (although we shall have to get around to doing this eventually! ), but recovering a fundamental sense of the sacredness of everything that pertains to the worship of Almighty God, both in the veneration of His inerrant and infallible divine Word and in the adoration of His all-holy Eucharistic Body — actions for the conducting of which the Church had never failed, and should never fail, to appoint hierarchical ministers.